Plant health can be affected by many influences. At The University of Guelph, Agriculture & Food Laboratory, with our experienced plant pathologists, we routinely provide scientific diagnostic results to resolve your plant health issues. Preventative measures are often much less expensive than curative approaches, while still impeding or avoiding disease development in plants as well as reducing or eliminating losses in quality. Our plant analyses encompass a wide variety of greenhouse vegetables, field crops and flowers. The quality of crops can be affected by many things. Receive testing today and use our plant diagnostic services and standard/custom analytical packages. Learn more below about our plant testing services or contact us to learn how our laboratories can meet your testing needs. Plant pathogenic bacteria are spread in many different ways and enter host plants through wounds or natural openings. They can cause severe diseases on plants including leaf and fruit spots, stem, fruit and tuber rots, blights, cankers, galls, scabs, and wilts. Our experienced diagnosticians use disease symptoms, bacterial streaming, and/or plating on microbiological media to confirm bacterial infection in plant samples submitted to the clinic. Biolog or DNA sequencing is then used to identify the bacteria to species. Our rapid PCR methods can be used for detection of bacterial pathogens. Many plant diseases are caused by fungi and fungi-like organisms. Plant pathogenic fungi cause a very wide range of diseases including crown, fruit, root, stem, and tuber rots, leaf and fruit spots, blights, cankers, damping-off, diebacks, galls, rusts, and wilts. Traditionally, fungal diseases have been diagnosed by disease symptoms and by observing fungal structures under a microscope. Structures such as hypae, spores, and the cells that produced spores must be examined to identify the fungal pathogen. When fungal structures are not present, symptomatic plant tissue can be placed in a moist chamber to promote fungal growth or can be plated on selective microbiological media to isolate the fungus. Our diagnosticians are experienced in traditional techniques for identification of fungal plant pathogens and combine these with the most modern DNA-based pathogen detection and identification techniques. DNA Multiscan is an accurate and rapid test that is available for detection and identification of fungi. This test is offered in Canada exclusively by The University of Guelph, Agriculture & Food Laboratory (AFL) and is based on proven molecular technology protocols. The DNA Multiscan can be used to test for plant pathogenic fungi in plants, soil and water. The basic scan can accurately detect over 25 pathogens. The diagnostic scan, can accurately detect over 65 pathogens. Scans specific to turfgrass and ginseng are also offered. Results are available in 4-5 business days. Use the links below to see sample reports listing the fungi detected by the different DNA scans. Viruses and virus-like agents are the smallest of the plant pathogens and cannot be seen with a light microscope. They are non-cellular and unable to reproduce without the cellular machinery of their host. They are immobile and unable to disseminate without the aid of other organisms or the environment. The genetic material of most plant viruses is RNA but in some viruses it is DNA. Viruses cause a variety of symptoms in plants including curling, mosaic patterns, mottling, necrosis, puckering, ringspots, stunting, twisting, and wilting. Viruses are often named based on the host plant in which they were first identified and the symptoms they caused in that host. Symptoms caused by a virus can vary depending on host, age of host, and environmental conditions. Some virus symptoms can be very similar to those of nutrient deficiencies and environmental stresses. Our diagnosticians recognize symptoms consistent with virus infection and use fast, reliable detection methods to test for the presence of common viruses. The Plant Disease Clinic provides detection of viruses and virus-like agents in plants by ELISA (immunoassay), RT-PCR (RNA viruses) and PCR (DNA viruses). We offer ELISA virus screens for the crops listed below. Virus screens test the common viruses of a crop. Please click below on the specific crop to view common viruses. We can also customize tests according to our client's requirements. Nematodes are microscopic round worms that inhabit a wide range of environments. Plant parasitic nematodes cause damage by feeding on roots of host plants and, in certain cases, cause damage by feeding on above-ground parts of host plants. Nematode feeding causes reduction of root mass and distortion and/or enlargement of roots. Damage to the root system also allows infection by other soil plant pathogens. Insect pests can cause significant damage to host plants. Our experienced entomologist can identify insect pests. If you are looking for plant identification services, we recommend contacting the Royal Botanical Gardens (RGB). Here are instructions on how to submit samples to the RBG. The Plant Disease Clinic (PDC) can test for resistance to Syllit (Dodine), Nova (Myclobutanil), Inspire (Difenoconazole), and Flint (Trifloxystrobin) using a fungicide plating technique. You can choose to test for resistance to all of these fungicides or test one, two or three. There are leaf collection and testing suggestions below for ‘Just Checking’ and for ‘Suspected Control Failure’. Due to the nature of the testing used, results will take up to four months. We also offer PCR testing for the G143A mutation, which is the cause of Trifloxystrobin resistance in most isolates. Results of G143A mutation PCR testing take approximately five business days. 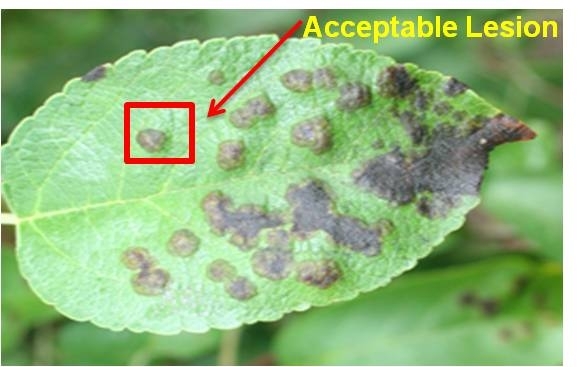 Collection of leaves with apple scab is the most important step in fungicide resistance testing. If leaves have been sprayed, collected at the wrong time or stored incorrectly, PDC may not be able to recover viable spores for testing. Success of fungicide resistance testing is greatest when leaves are submitted before the end of June. Please follow the collection instructions below carefully. Select six to eight test trees at the corner of a typical orchard block and leave them unsprayed until scab lesions develop on cluster leaves. 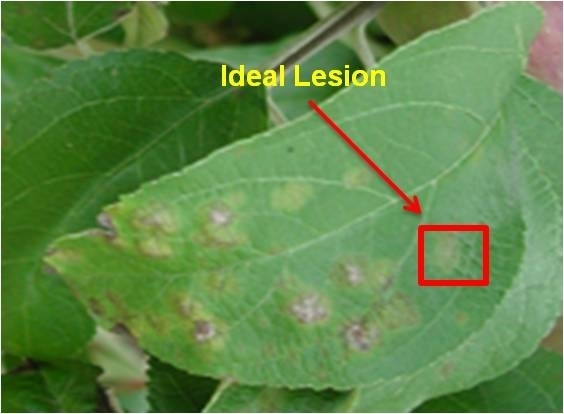 When scab lesions develop on cluster leaves, collect 50 young leaves containing fresh lesions. After you have collected leaves for resistance testing, you are free to spray the test trees. Testing 12 or 25 isolates of the apple scab fungus from the test trees is recommended. Collect 75-100 leaves with apple scab from throughout the orchard. Testing 25-50 isolates of the apple scab fungus is recommended. Collect leaves with fresh lesions. Photos courtesy of Kerik Cox, Cornell University. 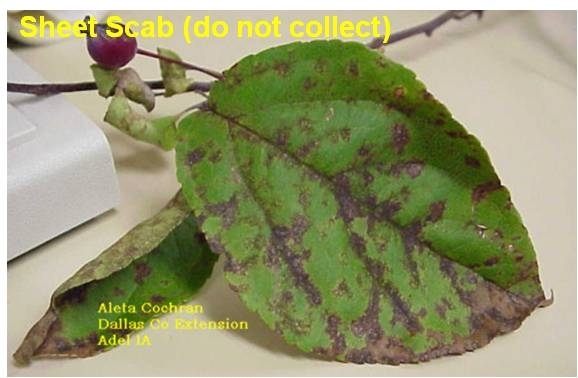 Collecting leaves with several separate scab lesions is OK but do not collect leaves with sheet scab. Please separate leaves with paper towel or newspaper to absorb moisture. Collect leaves after dew has dried. Do not collect leaves during or in the days after a hot spell (several days >28°C). Prolonged hot temperatures will kill the spores. Do not collect leaves immediately after a rain event. If there is a heavy or prolonged rain event, wait at least 48 hours after the rain stops before collecting leaves. Rain will wash spores from the leaves. After collecting leaves, keep them at temperatures lower than 24°C. 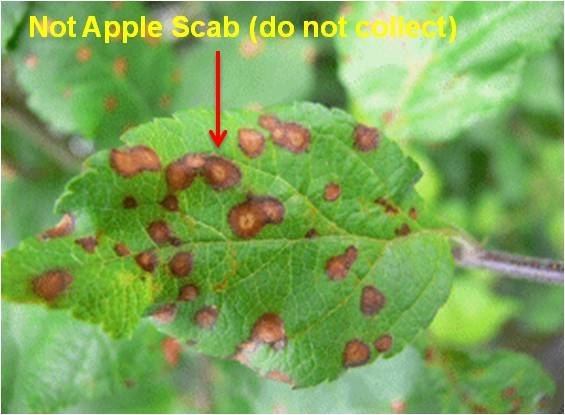 Spores of the apple scab pathogen are more sensitive to heat than other pathogens and being left in a hot location, such as a vehicle in the sun, will kill the spores. Send leaves by overnight courier or drop them off at out clinic. Do not ship on a Friday. If necessary, leaves can be refrigerated for one or two days before shipping. Shipping leaves in a cooler with an ice pack is recommended, especially in hot weather. Fill in a sample submission form to include with your shipment of leaves. Remember to indicate the fungicides to be tested as well as the number of isolates to be tested on the submission form. PCR Testing: PCR testing for the G143A mutation, which is responsible for Trifloxystrobin resistance in most isolates, is also available. Please contact us. **The fungicide plating technique was developed with the support of the Pest Management Centre, Agriculture and Agri-Food Canada, and the Ontario Apple Growers. There are many varieties/cultivars of a particular plant species. DNA-based tests accurately identify varieties/cultivars to ensure “true-to-variety”. This testing can confirm the presence of a superior trait, character, or value, for exporting acceptance, or for regulatory compliance. For example, there are six varieties/cultivars of Tebou beans and four types of Azuki beans which look alike. AFL has both single residue and multi-residue capabilities to test over 500 pesticide active ingredients. Our testing services allow you to address a wide range of concerns pertaining to the use and application of pesticides on all crops, vegetables, fruits, grains, and other vegetation.